Discussion in 'Windows' started by titorick, Jul 16, 2018. Rules of Survival is a Free to Play Battle Royale Shoot em Up game for PC and Mobile. Think of it as a massive Counterstrike game with 100 or more players using a gigantic De_Dust map. If I only install Rules of Survival on my smartphone, can I play it? – YES, You can play it on your smartphone. If I only installed Rules of Survival on my Computer, can I play it? – Yes, you can now login via your Facebook Account or Google Account. Where’s the link for Rules of Survival? How do I play Rules of Survival? I can’t play Rules of Survival? 5. How do I activate using my cell phone? Facebook? Google Account? Here’s a step by step guide with pictures on how to install and play this new and popular game for Internet Cafes. 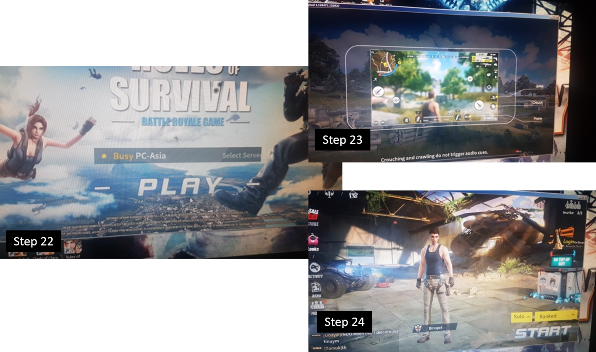 Step 1 – Download the Rules of Survival game on your smartphone. 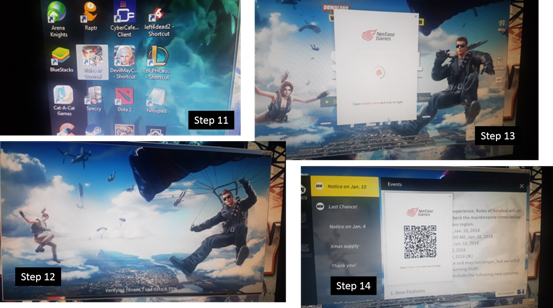 UPDATE: Feb 2018, Scanning via your Mobile Version of Rules of Survival is now just one of the three options available. The other two are logging in via Facebook Account or Google Account. Step 2 – Open your browser (Chrome, Mozilla, etc) and use open Google. 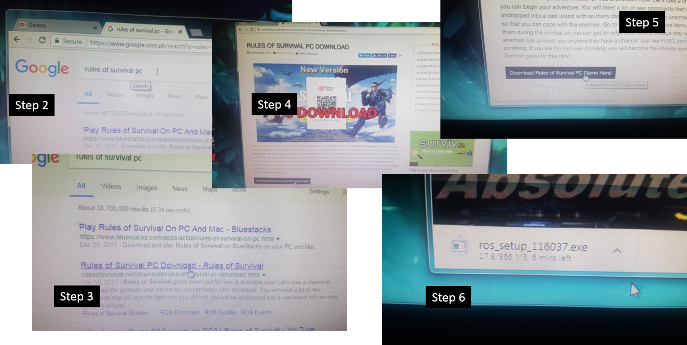 Type “Rules of Survival PC” , press Enter to search. 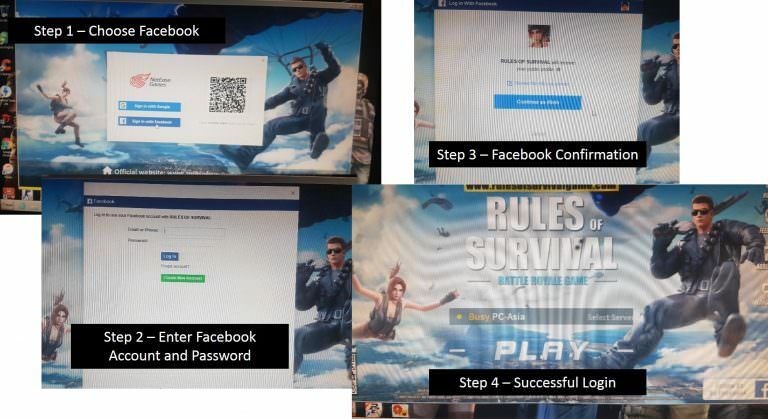 Step 3 – Click this LINK for the Rules of Survival for PC. Or see below links. Step 4 – Click the DOWNLOAD button. Step 7 – Find the downloaded ros_setup file and click to run the installation. Step 11 – Look for the Rules of Survival game icon on your desktop. Double Click to launch the game. 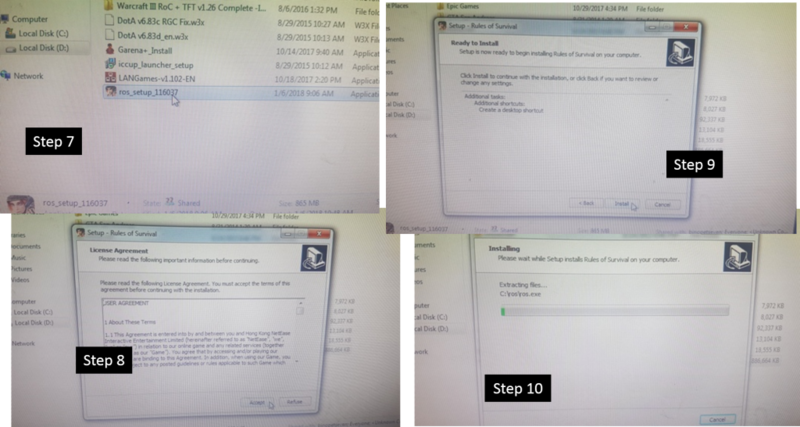 Step 12 to 13 – Launching and patching process. This could take a few minutes depending on the size of the updates. Step 14 – A QR Code, a square block of random black and white doodles, will appear. Step 15 – Grab your smartphone and click on the Rules of Survival game. Wait for until fully launched. Step 16 – Look at the bottom right of the screen. 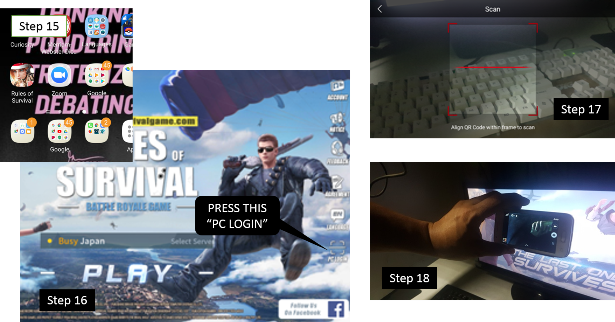 You will see the PC LOGIN button (see Step 16 picture). Press this to launch the Scanner. Step 17 – The scanner will use the rear camera of your smartphone. A square camera window with a moving red line will appear. Step 19 – Center the Square Camera Window on your Smart Phone on the QR Code. 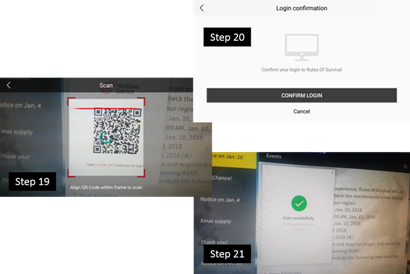 Step 20 – After about one second, a message will appear on your smartphone — CONFIRM LOGIN. Press this. Step 21 – On your computer, a message will also appear – SCAN SUCCESSFUL. After you press the CONFIRM LOGIN on your Smart Phone this message will disappear. Instead of scanning via Rules of Survival Mobile Version. You can now log in using your Facebook Account or Google Account. Step 22 – Welcome messages and some reminders will appear on the game screen. Click Next or Close. Then press PLAY. Step 23 – The game will now connect to the server. Step 24 – Your game avatar or character will appear. You can also customize your character. Press START. This will trigger the game to look for other players that are ready to start the game. Once the all the slots are filled up, the game will start. I have other computers and I want to play Rules of Survival for all of them. Can I use only one Smart Phone to activate or confirm? – YES, you can use the same smartphone to activate or confirm. But, you have to create multiple accounts ( I only know how to do this on Android). A. If you haven’t already, set up a Google account. B. Open your device’s Settings app. C. Tap Accounts Add account Google. D. Follow the instructions to add your account. E. If needed, repeat steps to add multiple accounts. 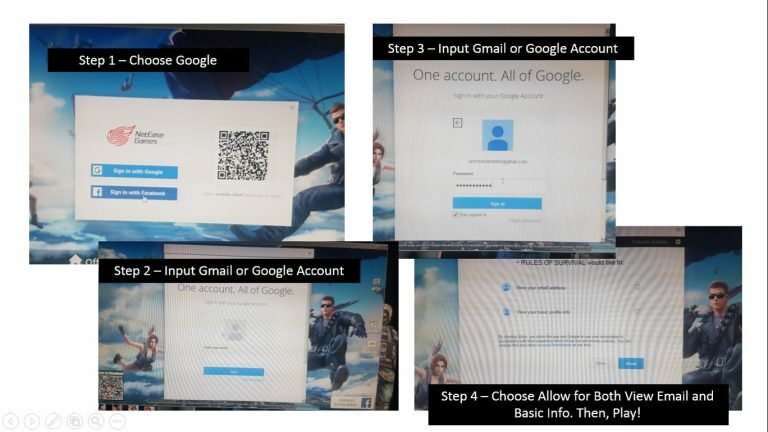 Do I need 1 Google Account for each Computer with Rules of Survival? YES, 1 account per 1 computer. Switch Google accounts then launch Rules of Survival. Then proceed with the Scanning Process. TS. sa PC ano po kailangan spec? para mainstall at malaro ko ito?